If you don't fancy the cutesy Chumby as your must-have tech bedside companion, then you might plump for the new Shuttle D10 mini PC with in-built screen instead. The D10 is a 'desktop' PC with a mini built-in 7-inch touchscreen, for the man who has pretty much everything, we can only assume. 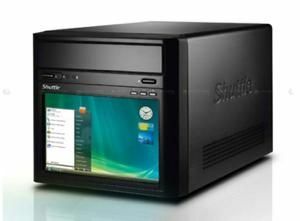 As with all Shuttle machines, the D10 is pretty well specced, packing in a Core 2 Duo E4000 Series, a Dual Core E2000 Series or a Celeron 400 Series processor. For ideal sound (or movie audio) in bed, the machine also features 5.1 channel audio. It will set you back anything from £260 upwards. Chumby will be sad.